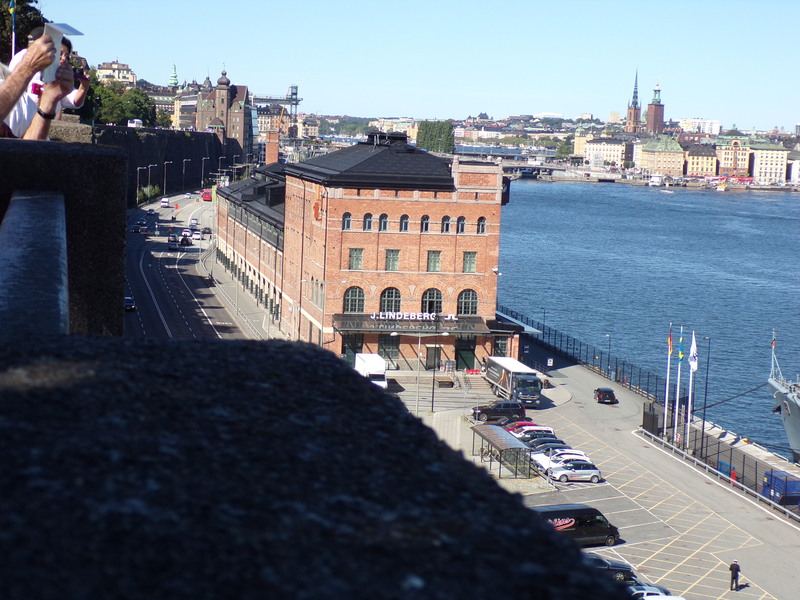 We met our guide, Britt, at our bus and proceeded to Gamla Stan, which means “Old Town” in Swedish, stopping briefly at a lookout point first, with a view of the harbor. 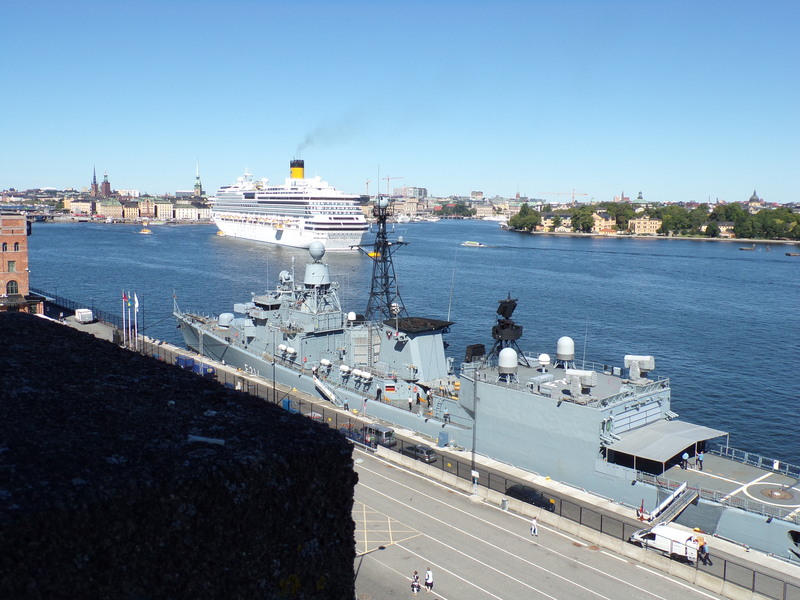 Stockholm doesn’t get a lot of cargo ships (perhaps because there is a larger cargo facility in Malmö), but it does get lots of cruise ships, and there are a lot of ferries between Stockholm and Helsinki, Tallinn, and St. Petersburg. 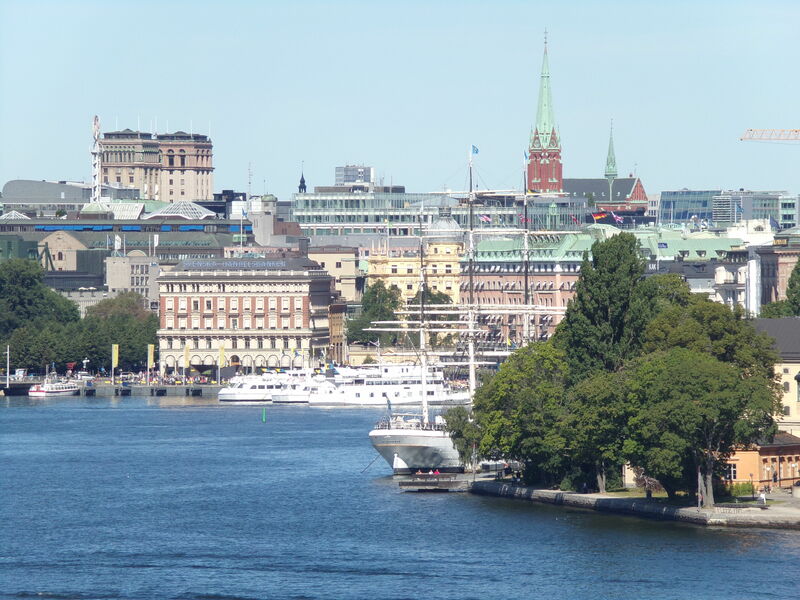 ½ of the city of Stockholm is surrounded by salt water, ½ is fresh water from Lake Mälaren, whose easternmost bay is Riddarfjärden which is surrounded by central Stockholm. (More on this lake, and pictures, in Day 2). Lake Mälaren is the third largest lake in Sweden, and provides drinking water for seven towns. 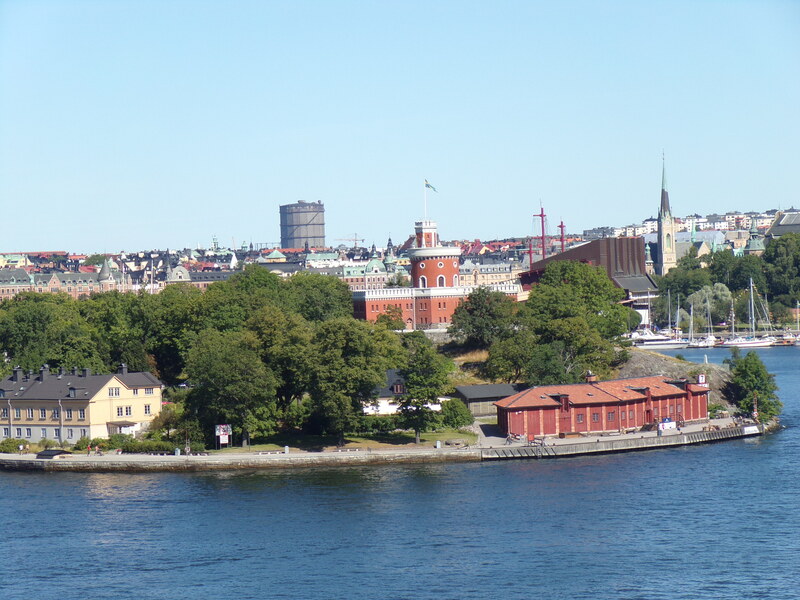 The city occupies 14 islands. (Holm means island.) In the metropolitan area, about 1/3 is green, 1/3 is water, and 1/3 is concrete or buildings. One island that used to be a royal hunting ground now has a zoo with Nordic animals. 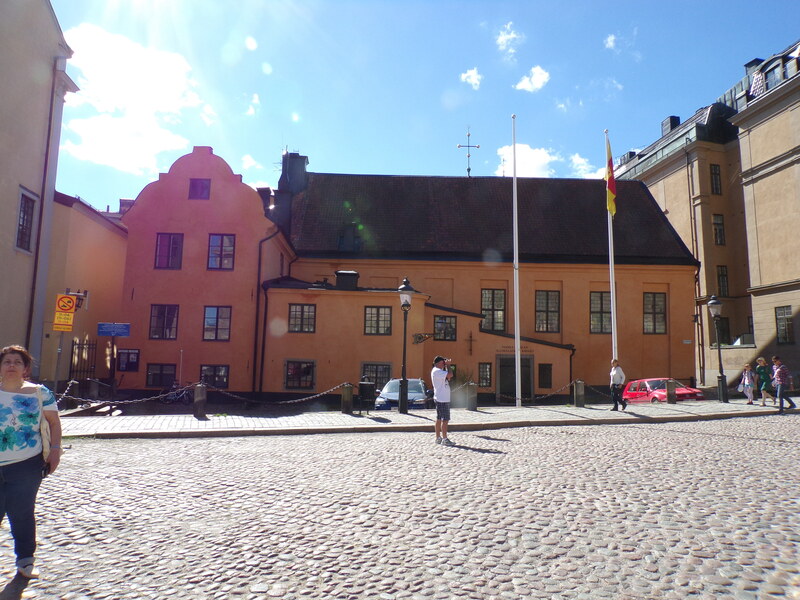 In Gamla Stan we stopped in a main square flanked by the Stockholm Cathedral (we didn’t go in) and the Royal Palace (Sweden has a constitutional monarchy). 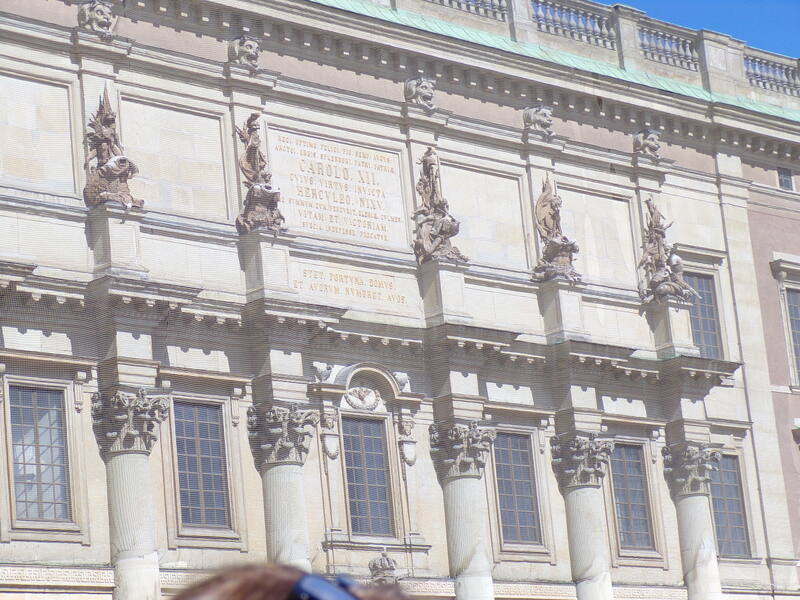 The square fills up with tour buses and there was a lot of construction, including scaffolding on part of the palace. In spite of the monument to Gustav IV (who was also the last Swedish king of Finland), the most popular monarch was Gustav III Adolph, Gustav IV’s father. He enacted many cultural reforms, and established freedom of religion and of the press. He had a dramatic death in 1792, when he was mortally wounded by gunshot at a masquerade ball. He died 13 days later. Verdi’s opera Un ballo en maschera is based on this story. 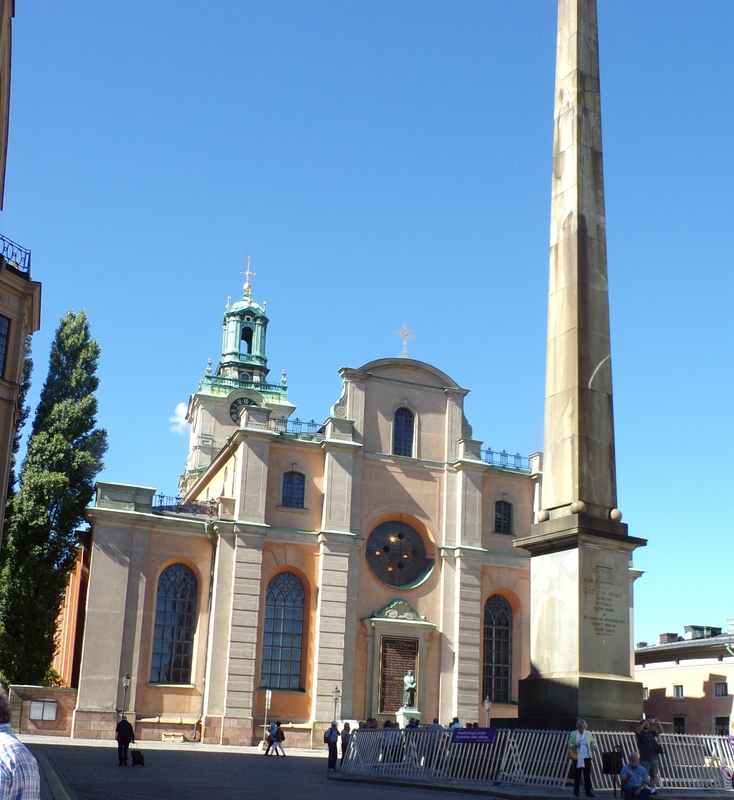 We walked from there to a church, behind which, our guide Britt said, was the “largest statue in Sweden – you’ll be amazed!” There was another tour group already there when we arrived, crowded around something that couldn’t be seen above their heads. 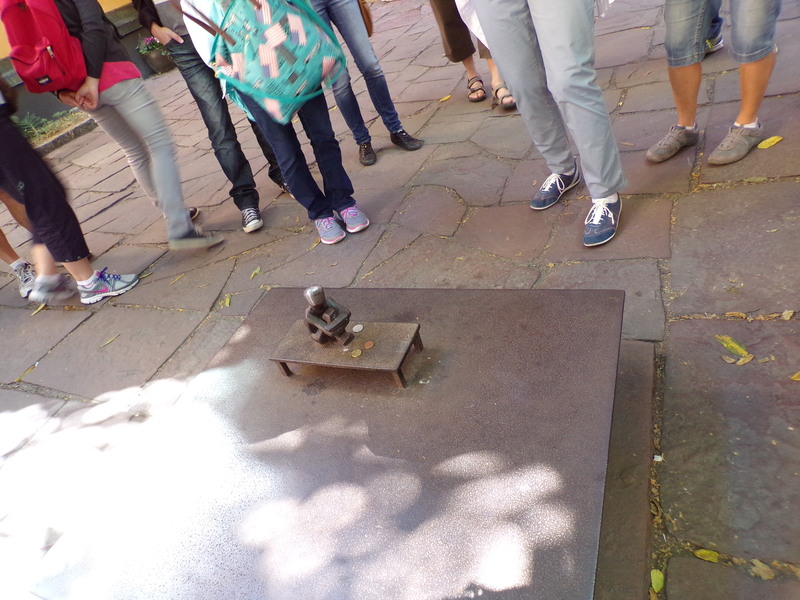 As they moved on, we saw a small statue about 6 inches high on a small platform, called “The Iron Boy”. The sculptor meant it only to be a self-portrait: a boy who can’t sleep so he sits on his bed and looks up at the moon. However, it’s taken on an almost mythic reputation. 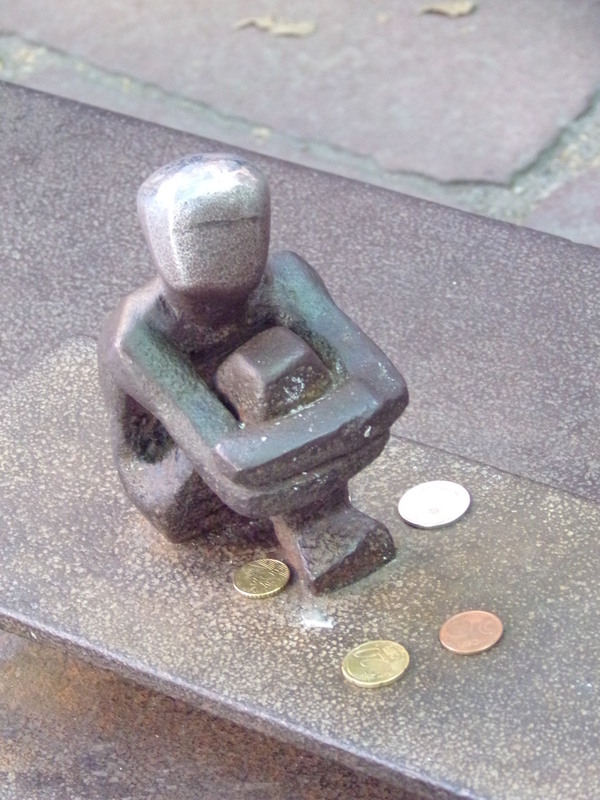 Rubbing his head (which is now shiny from so much rubbing) is supposed to bring good luck. Britt said either you come back to Stockholm, you’ll find love, or something else I can’t remember – I rubbed his head because I want and intend to come back to Stockholm! 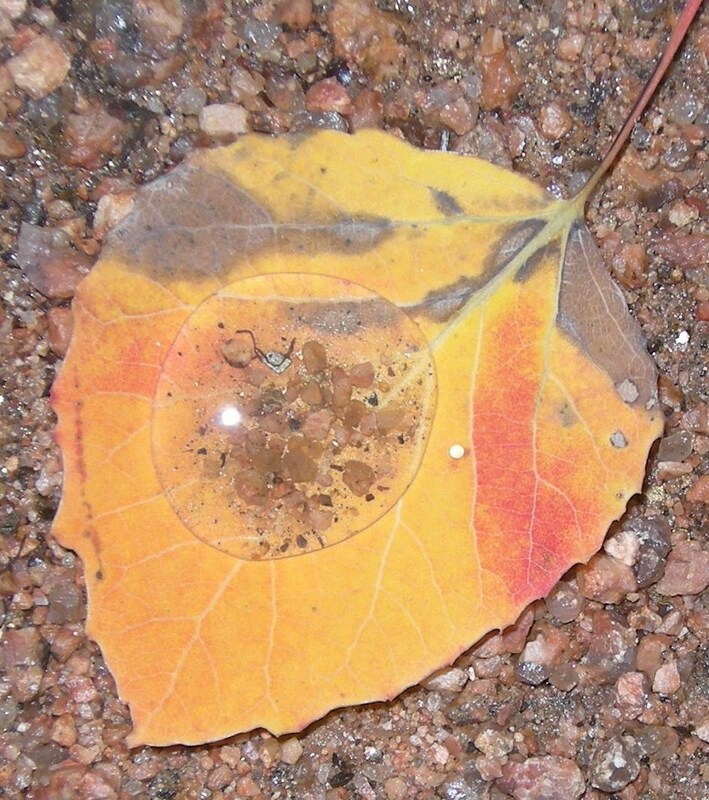 Also in the winter, people knit hats and scarves for him and dress him warmly. All this for a tiny sculpture without a face! 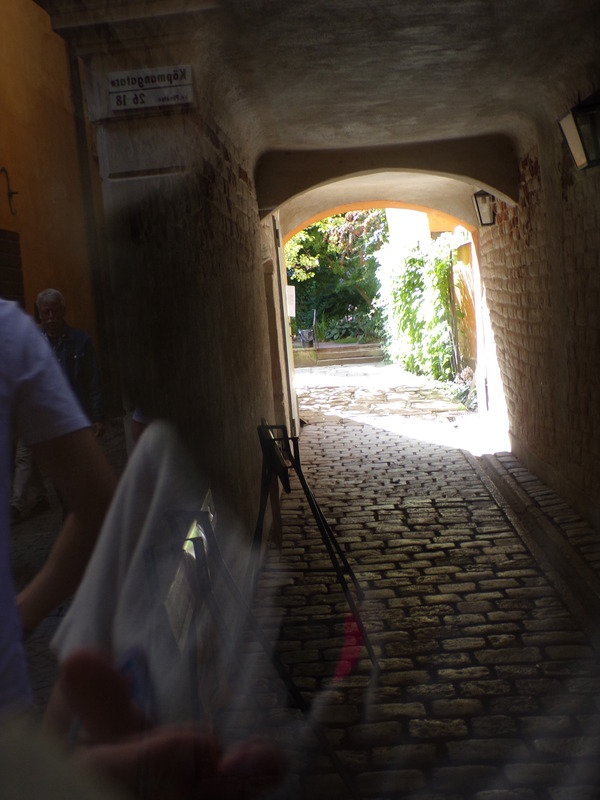 Britt then led us down the oldest street in Stockholm. She stopped at a doorway marked “No. 7” and told us to look upward. High up on the windows protruded little concave boxlike things which Britt told us were actually mirrors, allowing a person to spy on their next door neighbors to see if anything improper was happening! Big Brother of the 17th century! 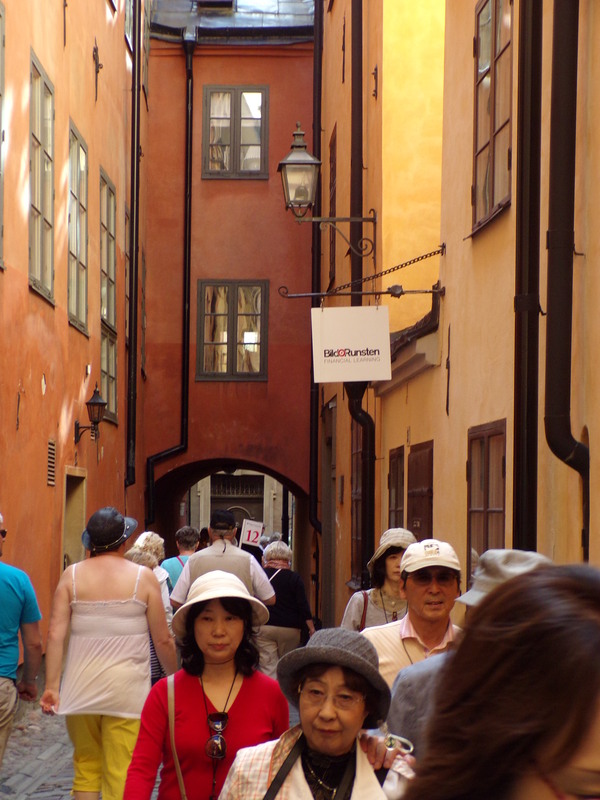 The narrow streets of Old Town were crowded with tourists. 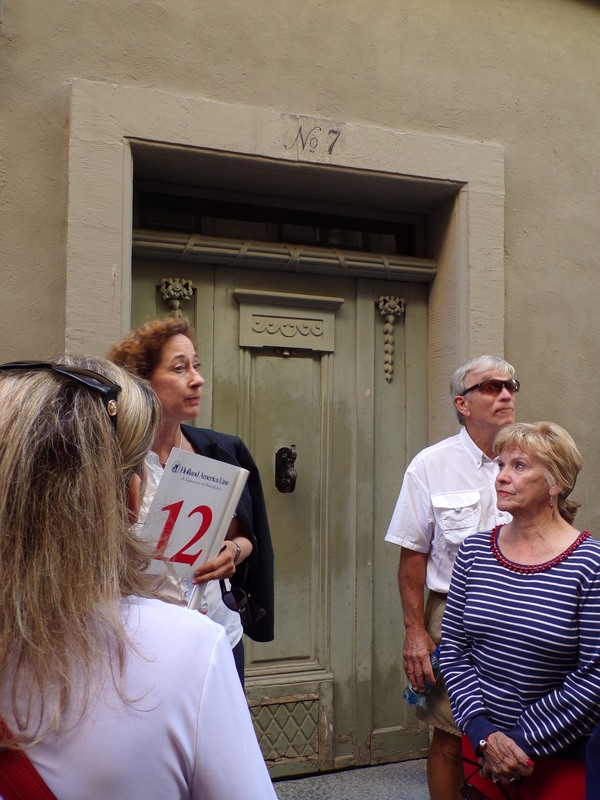 The only way to keep track of our guide was to follow the sign marked with a red 12. 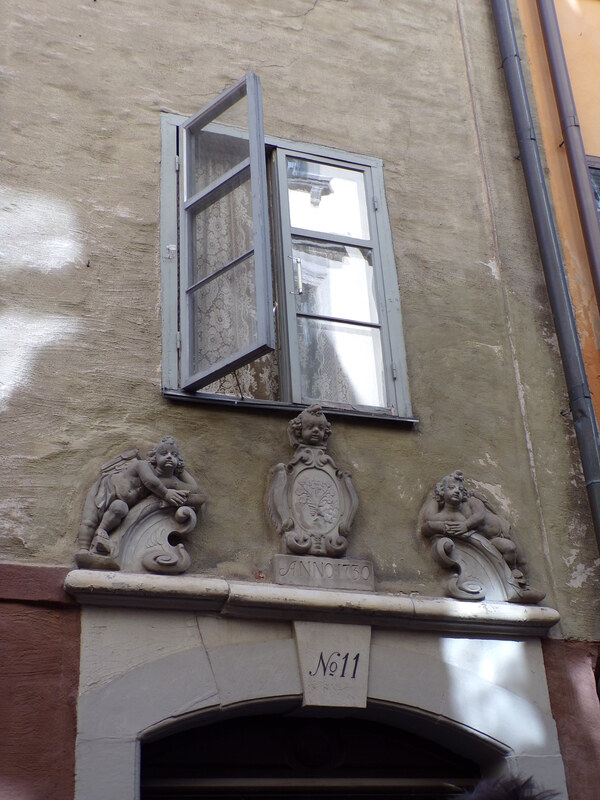 The 17th century had its share of Peeping Toms! 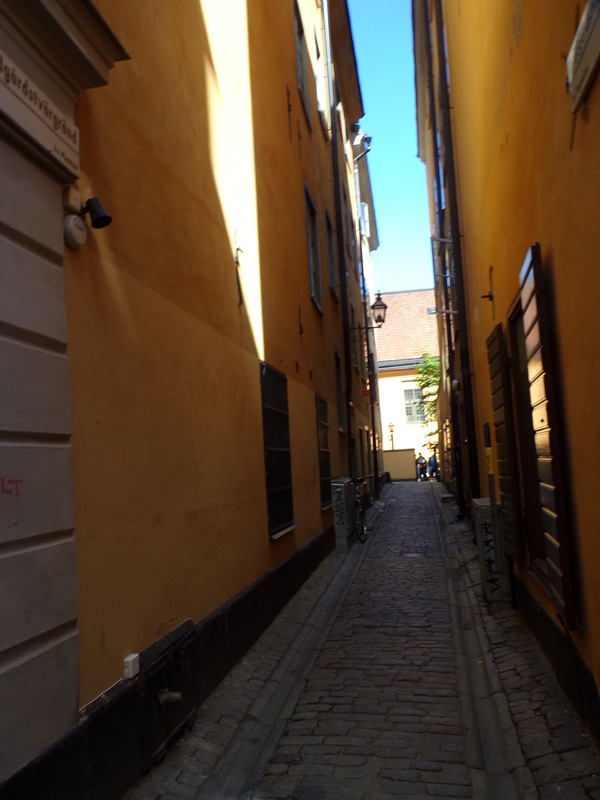 Some of the little streets in Old Town were extremely narrow – imagine navigating them in the winter when there are only a few hours of daylight! Down some of these alleyways were pretty gardens bordering small hidden courtyards. 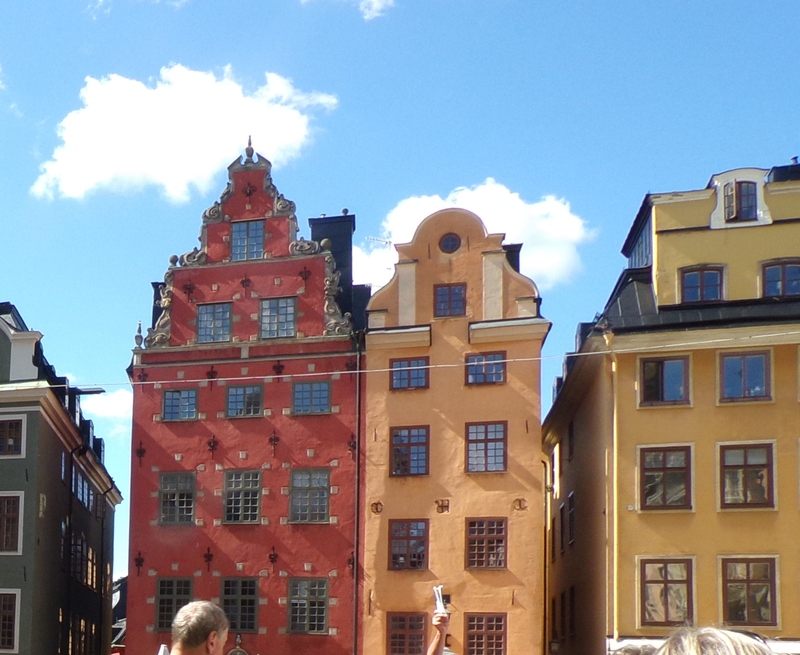 We also saw the leaning houses on Stortorget, another plaza in Gamla Stan. 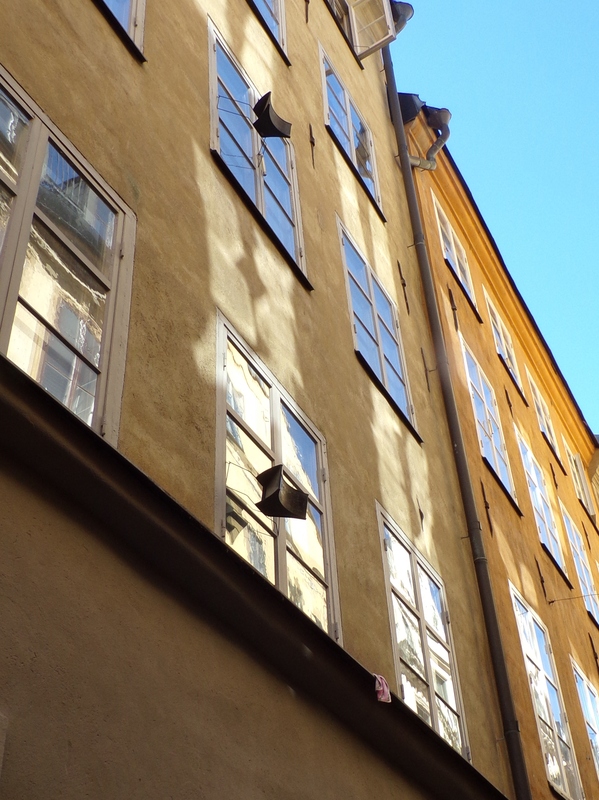 The 2nd one, particularly (yellow) – it leans 90 cm! 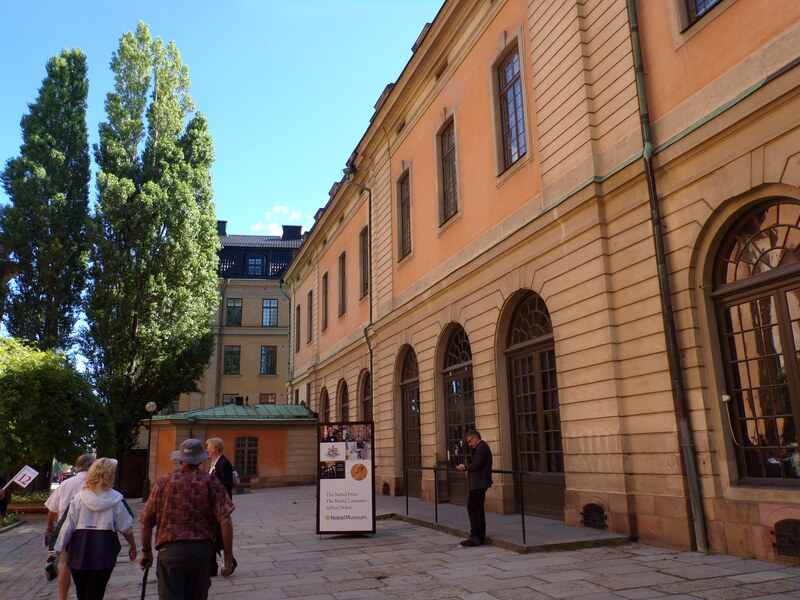 The Nobel museum is also on Stortorget, along with benches and sidewalk cafes filled with people enjoying this beautiful August day, their last week of summer vacation! 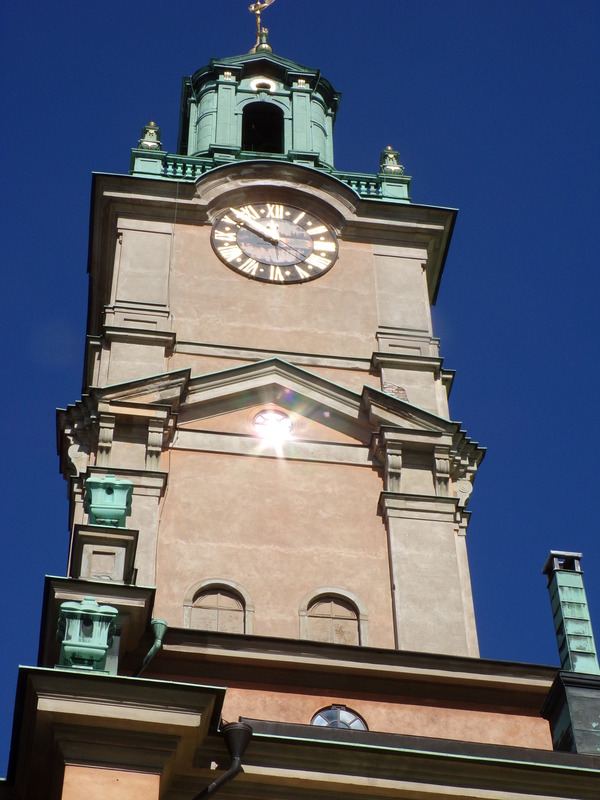 Because there are months in which there is little daylight – in Stockholm, sunrise is about 9 a.m. in December, and sunset is about 3:30 p.m. (farther north, there are only two hours of daylight in December and January!) – the Swedes are sun worshippers: they take advantage of daylight hours and warm weather in the summer to spend time outside. The June Solstice is a national holiday; many people leave the city. Many people own summer homes they go to during summer vacations – those that don’t have one, go to the cottages of relatives or friends. Unlike the northern part of the United States, Stockholm doesn’t get much snow in the winter; although temperature-wise, its winters are much like ours. 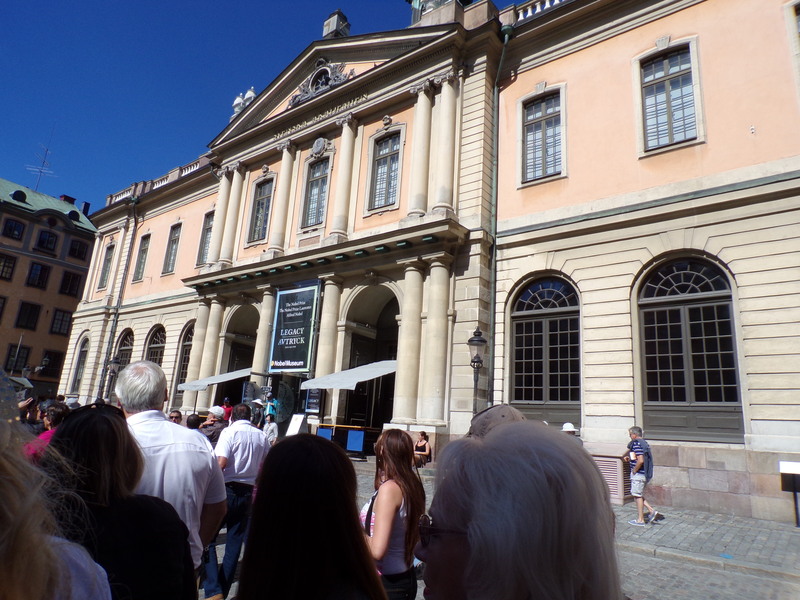 Stortorget, incidentally, is the oldest square in Stockholm, its historical center from which the city expanded. There was originally a wall surrounding the town and as the city grew, parts of the wall were knocked down and rebuilt farther out. 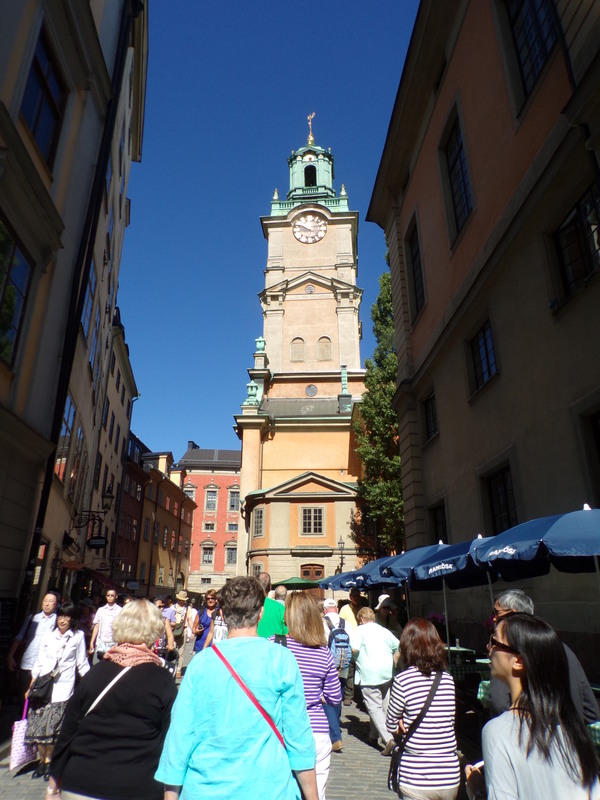 We walked toward the Lutheran cathedral, Storkyrkan (also known as Stockholm Cathedral), with a clock on the face of its tower, where bells tolled the hour. 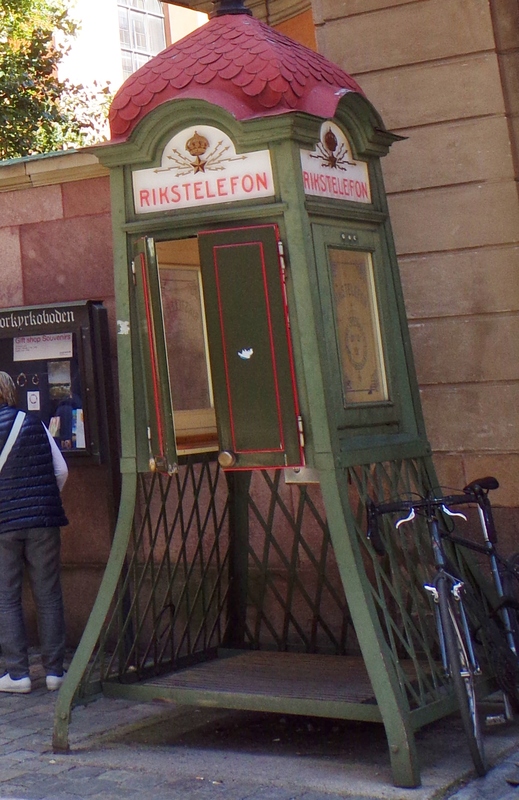 Nearby, I saw a funny, old fashioned telephone booth that no longer contains a phone, merely a silver plate with graffiti covering the spot where the telephone had been. 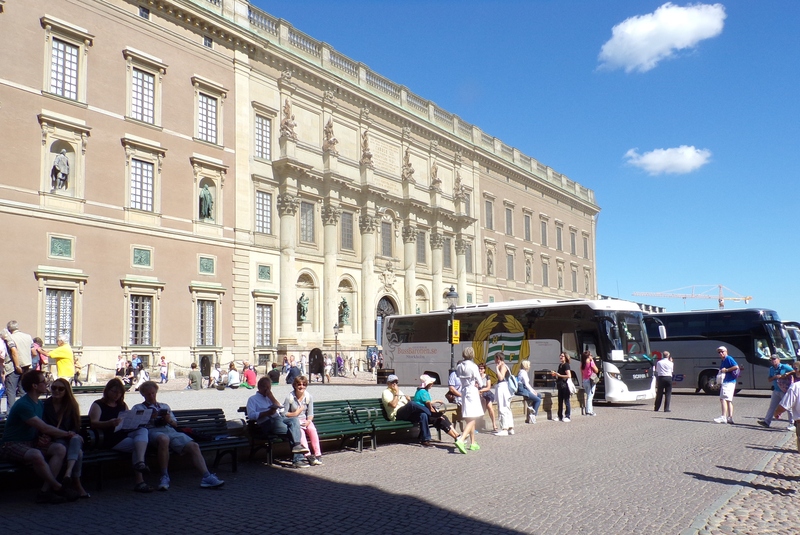 We then returned to our tour bus – a bit disappointing as I wanted to see more of Old Town Stockholm, but we were on our way to another city about half an hour drive from Stockholm. 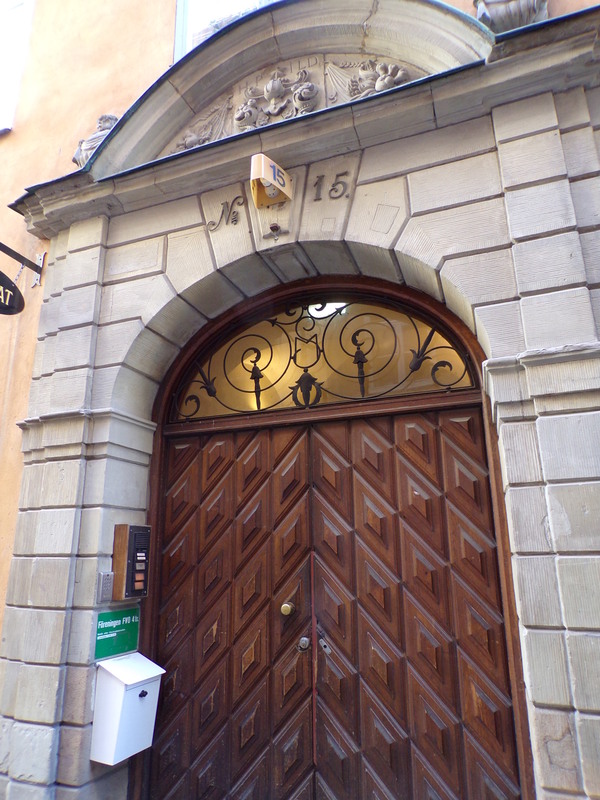 I hoped to be able to spend more time in Stockholm on Day 2.